Little Einstein ("Albert") is a medium, gelding pony. 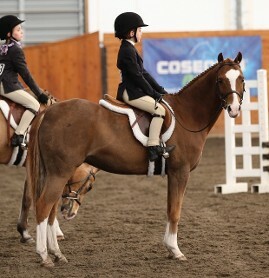 He's been many kids first show pony and is ready to take his next rider from walk/trot through pre-children's hunters. Auto lead changes, steady stride. More of a push ride. Available for sale or lease. Sail Away With Me ("Sailor") is a large, gelding pony. He as been leased, used in lessons and does well being ridden by various children. Sailor has 3 steady gates. An easy keeper that currently lives outside with other horses, and doesn't wear shoes. Sailor has been trail ridden, has some cross country experience and has competed successfully at the local level in all 3 rings. He would make a good short stirrup pony or novice level eventer. Aristotle (aka VJay) is a 16 year old experienced show pony who is currently available for sale or lease. He has a permanent height card at 14.1 3/4. 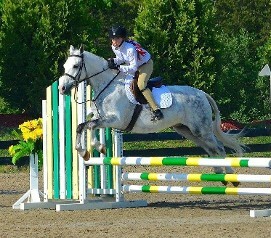 VJAY has been used in lessons, leased to young riders and has competed around the NY region for several years. Flying lead changes, easy keeper (can live out with others). Jumps up to 2'6". 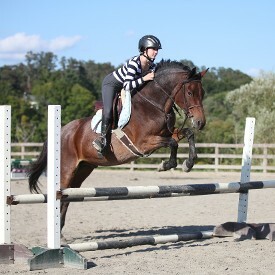 Truman is an 8yo, American Warmblood gelding available for sale or lease. He has both lead changes, easy keeper (can live out with others) and a very sweet temperament on the ground. He would be suitable in a lesson program, as an IEA horse or as a first equitation/jumper. Very honest to the fences; he can take a joke if the rider isn't accurate. Jumps 2'6", schooling 3'.